Willie Torbert attended Pratt Institute, Medgar Evers College and has publication credits with New York Newsday, Essence Magazine, Essence Art, Sony Entertainment, Mosaic Literary Magazine, Trend Publication, Amsterdam News Bayridge Press, and City Sun. 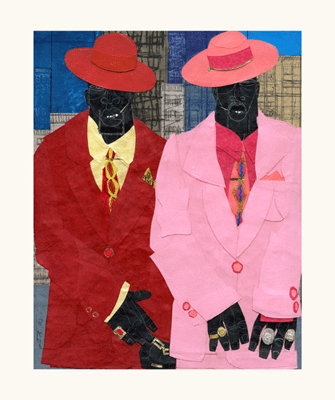 He has exhibited his work in New York, Atlanta, Florida, Washington D.C., and New Orleans. His prestigious listings of Commissions include Essence Magazine, Bacardi Rum, Thelma Hill Performing Arts, Harper Collins Publishers and Henry Street Settlement. As an artist who is also an educator, Willie Torbert has taught within the New York City Board of Education for ten years. During his work with the New York Public School System, Willie exposed his students to many facets of art through an array of mediums. When Willie moved away form his teaching job to work on his art full time, he received an award of citation for his dedication and work with the children of the borough of Brooklyn from Howard Golden, the Brooklyn Borough President. The Nubian Women’s Art Circle recently honored Willie for his outstanding contributions to the advancement of the art of the African Diaspora. Willie Torbert founded Zakiya Art Gallery in 1993. A gathering place for cultural events, art and jazz, Zakiya is a jewel in the heart of the Bedford-Stuyvesant community.